Freshly returned Mikey receives a date card so he takes Juelia along since y'know, she's the reason he's back. They board a private plan for their overnight date and get right to action kissing in the teeny plan. Expecting something romantic, they're instead surprised to see they've got front row seats to Mexican luchador wrestling. After Mikey's eyes widen like a child on Christmas day, the couple get a chance to play around in the ring, talk, and then get the Fantasy Suite offer. Juelia and Mike decide to share the suite together because they always do. Juelia is excited because she hasn't had a connection like this in awhile, completely forgetting her over-confidence in Joe less than a week ago. If you're tired of the Samantha and Joe drama, guess what? IT NEVER ENDS. Joe has come clean, but Samantha is letting Joe take all the heat and getting away with it all. Joe has text message proof, as does Nick since gossip is travelling about Sam's pre-show texting with Nick too. 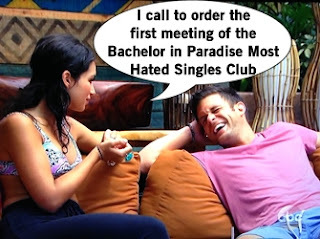 Joe confronts Samantha about their texting, their scheme ("Do whatever it takes to get a rose"), and that maybe she was coming to Paradise for Nick all along. It's circle talk for the umpteenth time and jeez, just move the story along already. Ashley I. and Joe commiserate as a new formed Lonely Hearts Club, wallowing in their sadness and giving each other awful advice. Once Ashley gets the crying out of her system, Jorge helps her remember that this week she has the power. With a little more optimism, Ashley gives Joe advice to try to re-introduce himself to Samantha to start over their relationship fresh. Samantha totally blows him off. Another strike out for Joe. Joe's buddy Justin arrives in Paradise and, whaddayaknow, he came here for Samantha. Despite Joe's pleas to not ask out Samantha, Justin follows his own heart and asks her out on his date. Let me guess, she texted Justin before too. Joe is pissed and Samantha tries to smooth it over and claim she hates drama, eventhough she's the center of it all. Oh Joe, now heartbroken and made the show's villain. Bad blood, yo. Need more? Read my recap of part 1 here.